Chto, nachalos’? is the sinister question that hangs in the air in 1953 Russia, before Stalin’s final pogrom meant to answer the Jewish Question. Has it begun? Pochti chto is always the response. Almost. Solomon Levinson, an aging actor and ex-soldier who fought with the Red Army is visited by Stalin’s goons in order to be dragged to the Lubyanka in the middle of the night, inevitably to be tortured and executed. He murders his would-be captors, then gathers a cadre of fellow Jews and plots to assassinate the deranged old despot who would have them all shipped to camps by cattle car. The only non-Jew is a black American man named Fredrick (after Fredrick Douglas) Lewis, a welder and engineer who came to Russia in order to escape Jim Crow’s America, to enter a land where you were seen as a member of your class, rather than a race. This turns out to be fantasy, as the ignorant Russian people refer to him as a gorilla and an orangutan. The prejudices of the Russia proletariat run deep. The Yid is an irreverent, three-act structure event, full of considerations, thoughts, reflections and arguments on race, bigotry, acting, art, war, death and killing. Levinson’s best friend and sidekick is a man named Aleksandr Kogan. The two of them banter and joust and harass each other over all these topics to the exhaustion of the people around them. Kogan is an old Red Army machine gunner, now a surgeon. Suspicion has grown around doctors in Russia, especially if they are Jewish, with rumors and accusations of vicious malpractice, murder and blood rituals being leveled against them. Here is one of the many ways in which author Paul Goldberg creates interesting paradoxes. In this case, it is a bizarre life cycle of a killer become healer become killer – though the last transformation is rooted in slander. Kogan, incidentally, is the one character who commits no violence, but who, in their anti-Semitic fervor, the Russian people would fear the most. By contrast, Levinson will balk at any squeamishness toward death. “Killing is killing. Life is life,” he asserts, responding to Lewis’ trepidation at having become the kind of man who kills. The Yid is smart in that it manages to be complex without being overwrought, pretentious or snide. There is no grudge against readers who may not know all the references, and who may not string together the interweaving elements. Speaking strictly of the narrative, The Yid offers an account of Stalin’s assassination, which has been speculated since his death, and giving it a righteous motivation – to prevent the further slaughter of a people who had just escaped a vile attempt at eradication. This is merely the staging, the set decoration, of the main event, which is to tell a thousand human stories, to capture a moment of genuine expression. Goldberg offers understanding of the most banally evil characters, giving them an inner world, a brief history, making them more than just extras, before snuffing them three paragraphs later. The violence becomes less gratuitous, more earnest, allowing each death to have weight and not to be simply a vehicle for story progression or to showcase the machismo of the characters. It also has the strange effect of making each death duller, or at least, we dull ourselves to their deaths. Maybe this is the intent. Goldberg’s complexity is thematic and not narrative, emotional rather than explicit, and this is where it gains its flavor and its power. The Yid bills itself as a tragi-comedy, and this can be gleaned by a straight reading. Goldberg refers to himself as a dark comic. The result is an adventure with plenty of jokes, but without laughter. 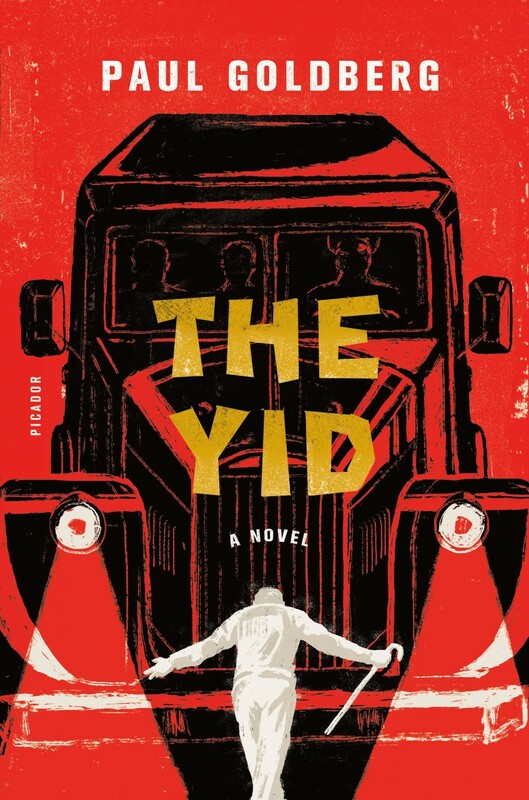 It does not even dare you to laugh, but no doubt the back-and-forth between characters and copious ironies marries The Yid to comedy as a tradition. Central to The Yid is the question of how much pretending to be a thing actually makes you that thing? If you pretend to be brave, isn’t actual bravery the outcome? What is the difference between acting as an assassin and being an assassin? This is curious, especially since we must consider that “Art is for the soldier,” according to the book itself. If this is the case, where does the severity come from? If it is to be authentic then the act must be realized – one must become the thing they pretend to be. It is not enough to suggest an assassination – assassination must be the final moment. And yet this is so vulgar, so undesirable. So be it, says this troupe, digging Stalin’s grave. It is better to be undesirable than to languish in silence and inaction. The Yid performs as a sort of play-within-a-play, except there is no audience. But if this were a play, the curtain would descend and the audience would stand and applaud.